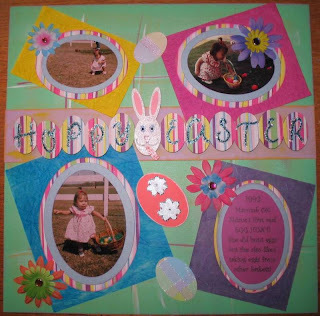 Since today is Easter I thought I would reschedule posting my layout entries for the HSN E2 contest and post some Easter layouts I have done over the years. They actually show how I have grown as a paper crafter. 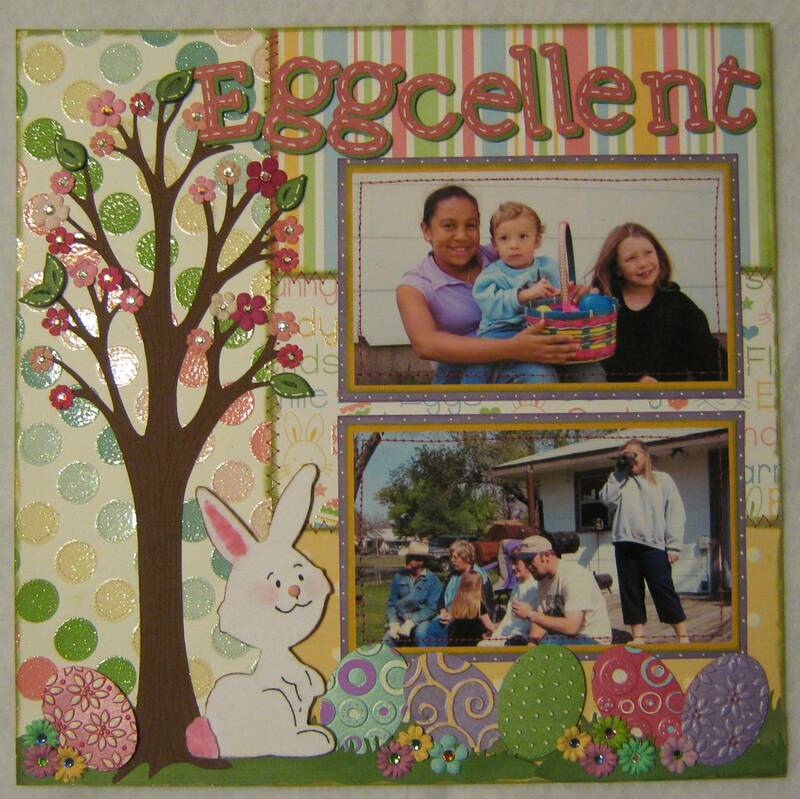 This was one of my very first layouts with the Cricut. Now I look at it I can see so many things I would do differently but I am just way too lazy to go back and redo the layout. The title, date and journaling tag were done with George, ahhh my beloved George. I still have that as my go too cart just because of the basic shapes. You guys promise not to cringe? I actually used Fiskar templates for the frames for the pictures. I think I had maybe two paper packs at the time and probably 15-20 sheets of cardstock *okie remembers when all her scrappy supplies fit in a rollytote and cringes at the amount of supplies she has accumulated in a matter of about 3 1/2 years*. The pictures for this layout were taken on my daughters first Easter she was able to take part in an egg hunt, she was about 16 months old. I got a little more creative with this layout and used the welding features in Design Studio for the title and the bunny in the middle *okie rolls her eyes at how primitive the bunny is compared to her DS skills now* and I was so proud of it. I had used some acrylic paints to brush lines on the cardstock for the base of the layout. Once again I used those orange Fiskars templates for cutting the mats for the pictures and the pictures as well. 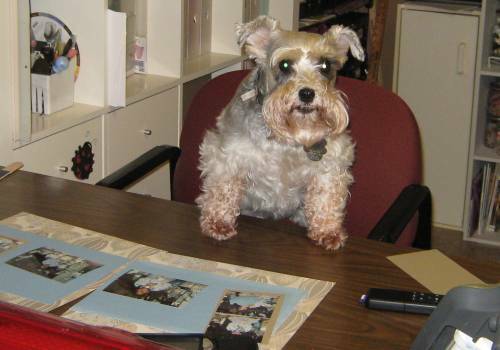 I am glad that I have learned to scan old photos and crop and edit to make layouts better. But even with the pictures not being edited better I look at how cute my daughter was and remember how I use to squeeze her tight wanting her to stay little forever. And I think that is what scrapbooking is all about, persevering those memories! 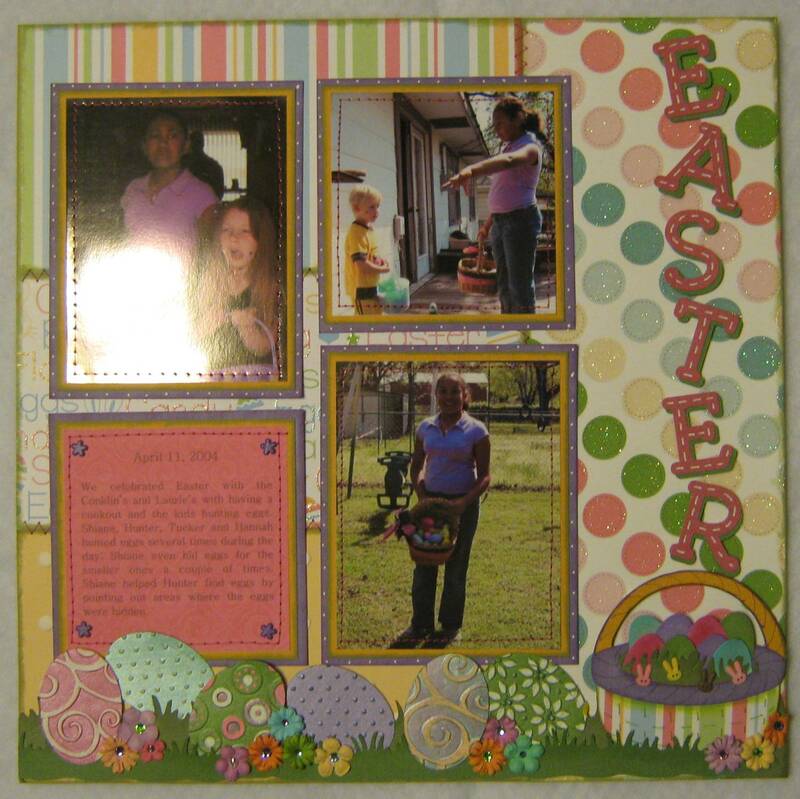 This last Easter layout was one that I did when I was on a Design Team *okie tries to shake those bad memories out of her head about being on THAT Design Team and the horrid way the designer s were treated*. Of course when you are on a Design Team you are expected to pull out all the stops on each project so I put a lot of work into this one. I do have the .cut file available for this layout. The file will cut all the elements and title but the eggs are left up to you to decorate. You can find the .cut file on the original post HERE. You will need the following cartridges - Stretch Your Imagination, My Community, George, Everyday Paperdolls, Lyrical Letters and From My Kitchen. Tomorrow I will be posting my other entries for the HSN E2 contest. These are so great. I look back at all of the layouts that I have done through the many years and see the changes that I have made. LOL As for the supplies, I also use to only have a small tote of supplies. Now I have a 20 x 15 foot room full of supplies. I too go back and think to myself.. geez I should of done this to this layout or that to that layout! Your layouts are fun to look at. and you did a wonderful job with all of them. DON'T redo them! It is fun to look back and see the improvement in ability and the changes in trends, etc. I look at some of my first ones and wonder what the heck I was thinking! 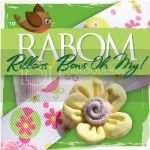 I don't think you should redo anything either - these are great LOs and you can really see your progress - and they help you remember the original "must have" tools like the Fiskars templates! LOL! And, thanks again for sharing the cut file - you are so talented! 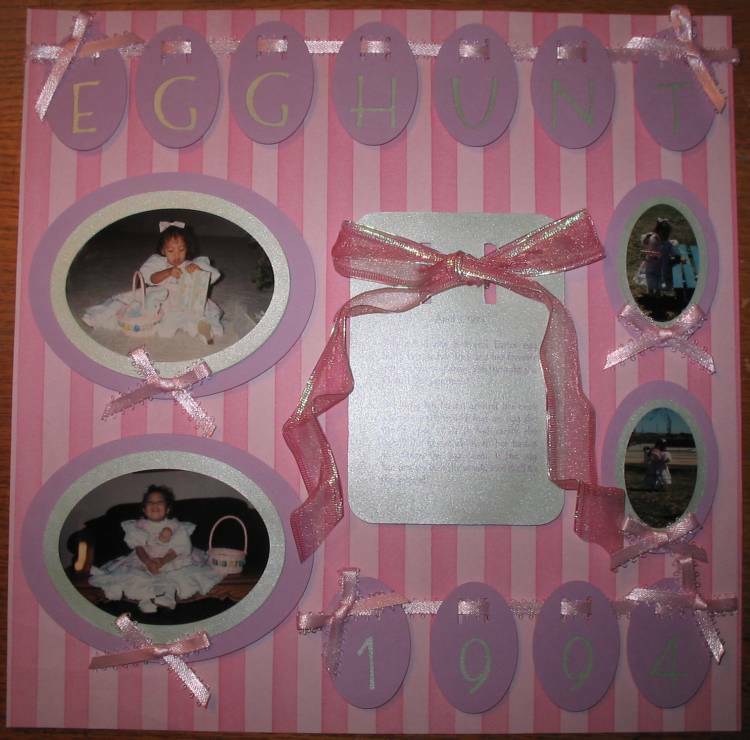 It is fun to look back, for the pictures, and for the scrapbooking skills and to see how much you've grown, and you have! These are all adorable, but the last one is exceptional with all the detail and the eeny weeny marshmallow bunnies in the basket! How cute! I like seeing how my LO's have changed over the years. LOVE your 2 pg Easter LO. Lots of room for pictures, but still enough room for fun, cute embellies! 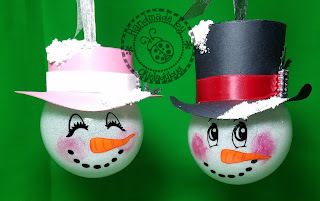 It is alsays so interesting to see how we grow in our crafting skills as we progress though the years, I know these layouts hold a special place in your heart. I took pictures of our family Easter yesterday and am looking to do something special with them.. It is a bittersweet Easter for us as just last week we learned my MIL has terminal cancer. At least all 5 kids and parts of their families includeing 4 of the great grandchildren were there. She is going downhill so fast I just hope to have it done so she can see it. I remember when you posted those first two lo's...how fun to look back and see how you've grown...as has your stash. I must have missed the two pg lo when you posted that one, but I love it! TFS! Oh i love love love that egg-sellent layout!! Wonderful fun memories! Happy Easter!